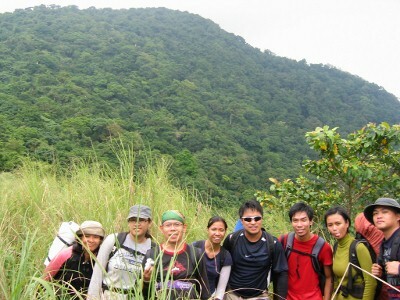 Friday, straight from the office, I, together with eight of my friends, met up in Buendia for our weekend getaway. It was our first trekking adventure together so we were naturally excited. Unbeknownst to us that this getaway would be more than just a typical climb—it would be an extreme adventure! I’ll admit that I’m hardly prepared for this climb because I didn’t really expected that it would push through primarily due to the bad weather a few days earlier. 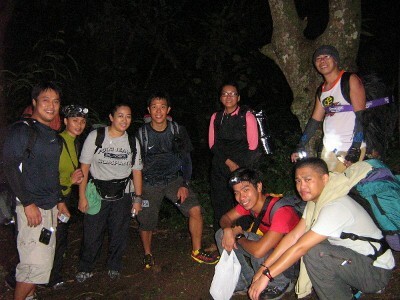 I just had my long-sleeve shirt as a jacket, some change clothes, sandals, and my trusty headlamp. Even my backpack was diminutive compared with the gargantuan bags my friends brought. It seemed like I was just passing by with my tee and jeans, although I was wearing my reliable NB 811. 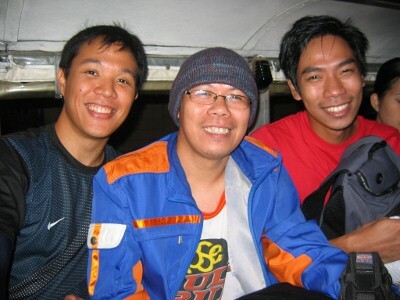 A few minutes before midnight we arrived at Cuenca, Batangas via Lipa after one bus and two jeepney rides. 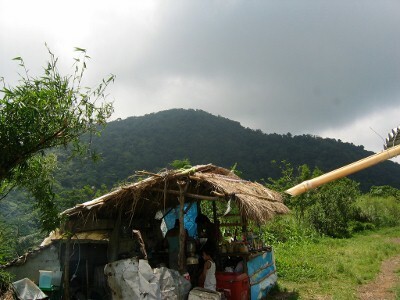 At first it doesn’t seem like you’re heading towards a mountain because of the development in the area—it was more like a walk inside a subdivision. A few minutes later after some wrong turns we arrived at the jump off point. After several minutes of following what we thought was the right trail, we noticed that we were no longer climbing but actually descending—wrong way! We just noticed that the mountain was already behind us so we went back some distance until we got onto the real right trail. We trekked on what is called the Grotto Trail. It has Stations of the Cross along its way and ends up in an actually Grotto. The view was amazing from the Grotto—you can see the lights of Tagaytay which was across the Taal Lake while the fog was climbing to the summit. It was like you’re in the clouds. After some time the group decided to finally climb towards the summit. That time we had no idea how far it was because of the prevailing darkness and since it was covered by clouds. All we knew was that we wanted to reach the summit. And this was when our extreme adventure began. 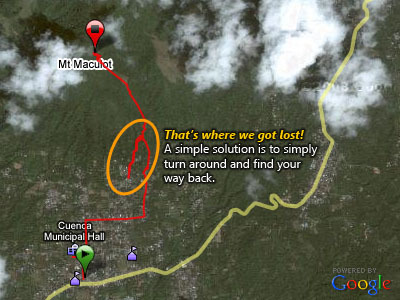 We all were expecting an “easy” climb, but after a few hours of trekking and still not finding the summit, something’s got to be wrong—wrong way again! Instead of simply following the trails, we found ourselves climbing almost vertical walls. It’s a good thing that ropes were placed so we could all, one at a time, climb to our next location. And this scenario repeated itself twice more during the course of dawn. It wasn’t a totally incident-free climb. We were fortunate enough that nobody got seriously injured during our feat, but it sure made our adrenalin rush for a moment. It’s during climbs like these that you truly appreciate the value of a headlamp. Flashlights are good but headlamps allow both of your hands to be free to do more important things than hold a light. After more than five hours my GF405’s batteries ran out. 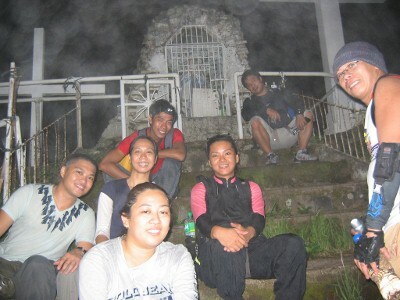 We still haven’t reached the summit then but the sun was rising so we were able to be rid of our lights. After some distance more we arrived at the third “rope moment” which was fortunately the last during the climb. 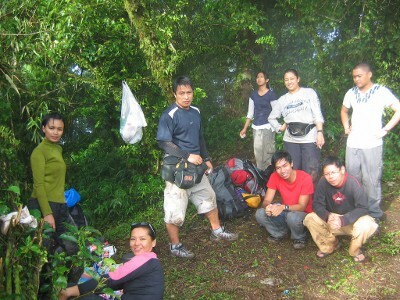 It was about 7AM (after seven hours of mountain climbing) when we decided to rest. We were searching all along for the summit that we didn’t realize immediately that we were at the summit! We were expecting a much different view of the summit but since we were at a different summit, the view was different. We actually ended up with the summit of the highest peak of Mt. 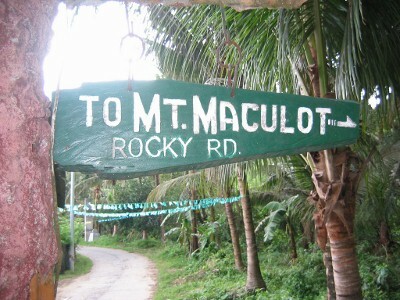 Maculot instead of the popular summit. According to Mar (ForeFoot Runner) we took the trail that locals call 45. 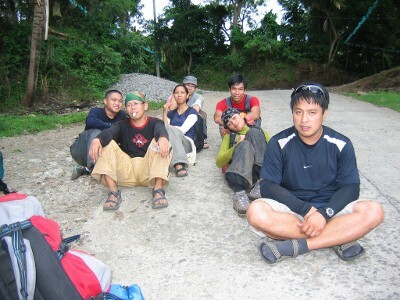 It was during this break when we had our “picnic.” It was fortunate for us that we have “real” climbers in the group so we had the luxury of drinking hot coffee in the summit with bread, corned beef, hotdog, tuna, embotido, eggs, etc. What comes up must come down. 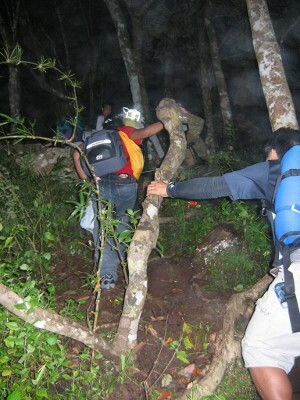 The problem that faced us was finding the right trail going down. Mar scouted for some trails leading down but the first ones were too steep. Eventually we found a “tamed” one, not as steep but definitely not easy. If our climb was difficult, our descent was no different. It was good if there were vines to hold onto as you can simply “rappel” down; if there’s none you’d have to use all your limbs including your rear—“five wheel drive” sort of speak. You’d eventually learn to do some tricks while scaling down this mountain. By coincidence or sheer luck our descent trail eventually leads us to the “pop summit”—where we should’ve been a few hours earlier! We couldn’t be more happier just to see the (in)famous store there. The thought of an ice cold soda and halo-halo was all that occupied our mind! After some carbo-loading (and snoozing for some) we were ready to take on the “real” easy trail downwards. If we were able to take this trail we would’ve reached the “pop summit” area so much earlier, but then again we would’ve missed our extreme adventure. 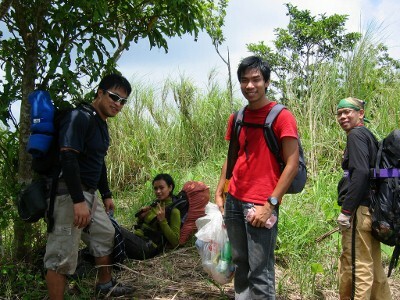 It was noontime when we were finally able to descend the mountain. I was so hungry then that I ate six types of food that time alone! We still had some more activities that followed that I’d no longer put into details. One thing is for sure, this adventure was definitely one for keeps! 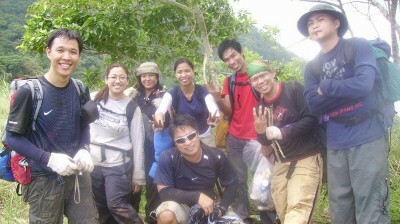 To fellow trekkers, I hope that we’d be responsible enough to bring our trash down with us. I know it’s difficult but if we didn’t hike the mountain that trash wouldn’t be there. Just some friendly reminder for everyone to enjoy nature. I’d like to thank the people of Cuenca, Batangas for their hospitality. I’m sure that this won’t be the last time I’ll visit Cuenca. To my teammates, I salute you for doing what we were able to accomplish. Not once did I hear anyone complain. To Mar, thank you for getting us “lost” and giving us one instant summer adventure. This would surely be one adventure to remember and definitely would just be the first of more to come. Special thanks to Bong, Mar, and Ross for the pictures! 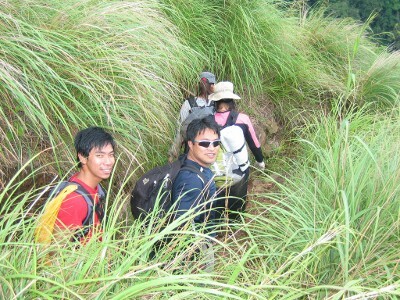 For some wacky outtakes of this climb (sorry but it’s in Tagalog only), you may visit my multiply site. > Thank you Cecil! I’ve no problem with jeans hehe. We did try those, including a lot more “stunts” just to safely get down. There were just areas where there’s nothing to grab onto (strong enough at least) so we had to use all our “resources” hehe.